The pianist plays the keys. The keys, which are basically levers, push up on a complicated series of other levers and pivots, called The action. The action then transfers the pianist's blow to the hammers, which are made out of wood covered with felt, and they then strike the strings. The strings vibrate and create the pitches (notes) at various frequencies. The strings are held in place by steel tuning pins driven into a thick piece of wood called a pinblock. 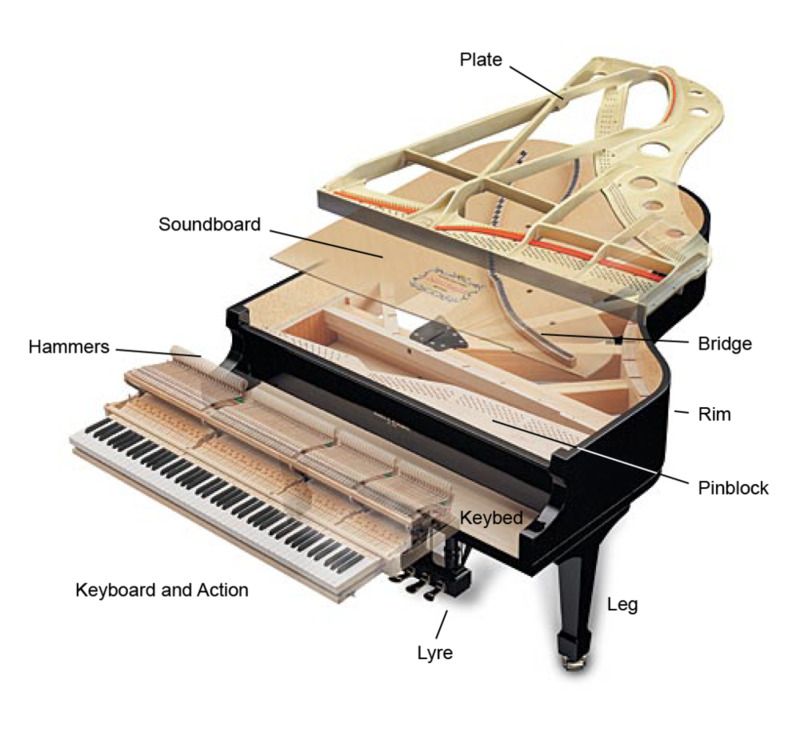 It is important that the pinblock grips the tuning pins tightly enough that the strings stay in tune, but it must also allow the pins to move enough that the piano technician can turn them and tune the piano. The strings are connected at one end by the tuning pins and pinblock. The strings pass over the bridge transferring the vibrations of the strings to the soundboard and are attached at the other end to the cast iron plate. The soundboard is usually made of spruce and acts like an amplifier, enhancing the tone of the strings. The cast iron plate holds the tremendous tension of all the strings. Finally, the case contains all the parts and keeps the soundboard taut. Piano Life Saver replacement products & piano cleaning supplies. © 1992-2017 by Carl Radford. All rights reserved. No copies or reproductions of photographs or content may be made without the permission of the author.